The Explorer rollover and tire problems go back to the early days when the Ford Explorer was still on the drawing board. Instead of designing a completely new frame and platform for a Explorer, Ford chose to use the existing smaller Ford Ranger truck frame and the smaller sized tires. Ford's recipe for the perfect rollover vehicle was born. While the Explorer was being tested for the market place, Ford's own engineers knew of its potential to rollover due to instability and its high center of gravity. In order to counter this problem, Ford decided to lower the tire pressure because softer lower pressure tires help to control the vehicle from going out of control and sliding out, but at the same time tires with lower tire pressure also heat up quicker and have a higher chance of a blowout. Further, tires with already lower pressure can also be more susceptible to road hazards and tire punctures, thereby again lowering the tire pressures due to a puncture and again heating up the tire to even higher temperatures on the highway. Lower pressure tires on an Explorer when fully loaded can easily become over-loaded thereby creating higher temperatures in the tires creating softer tires resulting in more frequent rollovers from blowouts and tire failures at highway speeds especially in the summer months. This became a real Catch-22 situation for Ford and its designers. While the Ford engineers would have liked to have built a bigger and wider frame to begin with, they had to made do with Ford's leaderships decision to save money and try and capture the market lead in the upcoming SUV market in the 1990's as the Chevy Blazer was coming to market about the same time period. Since the start, the early models of the Explorer were plagued with rollovers and pounded with rollover lawsuits for catastrophic injuries and deaths. Not until years later new models of Explorers were developed and some, but not all of the rollover issues were addressed with bigger and wider frames with bigger more substantial tires, more and better airbags, and the introduction of electronic stability control (ESC) to help counter over steering, over correction and over braking. This rollover computer no doubt has saved 1000's of lives, but other issues with the roof strength and other safety issues still haunt the Ford Explorer. 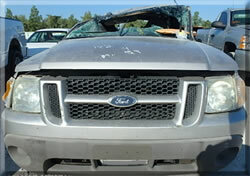 As Ford Explorer and other SUV's were becoming more popular and numerous throughout the United States, so began the evidence of an epidemic erupting of new rollovers. Before SUVs, the most popular style of vehicles most people drove were sedans, station wagons or passenger type vehicles which by its very design was lower to the ground therefore had a lower center of gravity allowing the vehicle to be controlled without sliding out and tipping over. As more and more of these SUV's started being flipping more attention in the news appeared. For many years Ford and the other auto makers would quietly settle the majority of the rollovers to keep the problem quiet whiles SUV sales roared, but soon some catastrophic injury cases demanded the nation's attention in the press and in the courtroom. 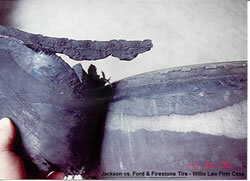 One of those cases was the infamous Jackson vs. Ford Explorer and Firestone Tire. The Jackson Family were traveling on Interstate 45 headed north back to Houston, Texas when the back left tire detreaded (see picture) and caused the vehicle to go out of control and roll over. Sadly Mr. Jackson was killed, Mrs. Jackson lost both legs and a grandson in the back seat broke his neck. The Jackson's longtime friend and lawyer researched for a lawyer to handle this product liability case and contacted David P. Willis of the Willis Firm in Houston, Texas. Willis had handled many rollovers and tire cases in past and immediately hired experts to get to the accident scene and bought the vehicle out of salvage and had it moved to a locked warehouse to be preserved as evidence. The tire and pieces along the roadway were also found and helped in putting the pieces of this puzzle together. In order to build a big case against the negligent defendants, Willis assembled a team of lawyers he had worked with many times before to push this case to trial. During the discovery phase of this case, some very damaging documents revealed the enormity of the size of the Firestone Tire and Explorer rollover problem throughout the nation. With the discovery of these documents into evidence along with other documents around the Nation, the National Highway Traffic and Safety Administration (NHTSA) pushed Ford and Firestone to come public with the problem leading to one of the largest product recalls in U.S. History. In fact over 8,000,000 tires were recalled from tire shops and warehouses along with million more tires still in use on Ford Explorers and other vehicle. One problem however became apparent, due to a shortage of replacement tires, many Ford dealers only replaced the tires on the ground (on the vehicle) and not the spare in the trunk. Therefore creating potential rollovers in the distant future. As a result of the hard work and dedication Willis and others did in the Jackson Case and other Firestone cases, the President of the Association of Trial Lawyers awarded Willis the Stephen Sharp National Public Service Award for his help in discovering the defects and helping to make the highways and the vehicles safer for the consumers. Yes, bad tires on an unstable vehicle design creates a dangerous combination, but the Ford Explorer has had rollover problems with good tires too. In fact even without a tire failure, Ford has still been one of the top rollover leaders for 20+ years. Bad tires can start a rollover, but poorly designed seatbelts, airbags and weak roofs also contribute to the high number of injuries and deaths in Explorer rollovers. Defective airbags or the lack of side curtain airbags have contributed greatly to the high death toll. If the occupant's seatbelt holds them in their seat and the airbag works, the weak roof often comes into play. The roof on a Ford Explorer like many SUV and trucks is too weak and will crush under pressure. In fact in a drop test the roof will often collapse and intrude into the safe or survival spaces of the occupants causing major traumatic head injuries and spinal cord injuries which can sadly result in paraplegia or quadriplegia to the rollover passengers or driver. Roof collapse on the Ford Explorer could have been reduced by using heavier gauge steel and a cardboard or high density foam inserts into the roof pillars and supports to prevent such dramatic collapse and failure. If someone in your family was seriously injured or killed in an Explorer rollover accident, contact the Willis Law Firm to receive a free legal evaluation. Mr Willis is a Board Certified Personal Injury Trial Lawyer with over 30 years of product liability experience. Get a team of lawyers on your side fighting for you. Call 1-800-883-9858 for a Free Rollover Case Evaluation.